We're really excited to offer a unique "Mini Winter Cruise" on board Hopscotch in early 2019. Let's be honest, Winter in the Pacific Northwest can be rough on everyone. But the San Juans offer a local, uncrowded, mini retreat that can take you out of the gloom and into adventure. Did we mention that the San Juans get less than half as much rain per year as Seattle! We would never suggest that a Winter cruise in the San Juans is going to be all t-shirts and sunglasses (although it is possible). But we can guarantee that you'll have a fantastic trip filled with great food, amazing sights, cozy accommodations, and first class service. Whether you're a local who's been coming to these islands for years, or this is your first time to the San Juans, you'll have an amazing time enjoying them in their winter beauty...and you'll have them all to yourself! Our Winter Mini-Adventure is designed to keep us in protected water, and take advantage of the rugged beauty that these islands display even (and sometimes especially) in the cooler months! Our Adventures begin and end in the charming town of Friday Harbor, on San Juan Island. The first day of our trip begins at 1pm. Which means you've got time to grab lunch and take a stroll around Friday Harbor. Hopscotch will be docked at the main Marina (the Port of Friday Harbor). The Marina, Ferry Dock, and Town are all right next to each other and can easily be navigated by foot...no car necessary! We recommend that you DO NOT drive your car onto the ferry (Parking is available at the Anacortes Ferry Dock), and instead "walk-on" to the ferry. Walking on is much less expensive, and you'll not have to arrive too early or wait in long ferry lines. You should catch (at the very latest) the 10:20 AM Ferry departing Anacortes. You'll arrive in Friday Harbor at 11:40 am, and have plenty of time to grab lunch, and do a little exploring before we meet at 1pm. You can travel by car to the Anacortes Ferry Terminal and park in the lot there. You'll need to be parked and purchasing your ticket by 10am. If you are leaving from the Seattle area, plan on departing your home by 8am. If you choose not to take the ferry, your other option for travel to and from Friday Harbor is by plane. Flights leave daily from Lake Union (downtown Seattle, by seaplane), and Boeing Field (just south of Downtown Seattle). Flight information can be found on the Kenmore Air website. If you fly out of Lake Union (we recommend this...it's really cool!) you'll need to be on the daily 8am flight. You'll arrive in Friday Harbor just before 9am. You'll have several hours to explore Friday Harbor, check out the shops, and find some delicious food before we meet at 1 PM. If you fly out of Boeing Field you'll need to be on the 9am flight, which arrives at 9:35 am. You'll need to walk (it's about a mile, but downhill and pleasant) or take a cab down the hill to the town of Friday Harbor where we will meet at 1pm. We will arrive back in Friday Harbor by 1pm on the 3rd day of our Adventure. You'll have plenty of time to relax and catch your ferry or plane back to the mainland! Planes leaving the airport on heading to Boeing Field Depart at 4:05 pm. We board Hopscotch on Sunday afternoon and return on Friday afternoon. Board Hopscotch in Bellingham, Washington. Let us pamper you as we embark on a wonderful vacation that starts in Bellingham at 2pm on Sunday. As we leave Bellingham Bay we will head up Hale Passage to make Sucia Island our first night. Sucia is a beautiful marine park with lots of hiking, beach combing and lovely little coves for anchoring. After dropping anchor, get ready for a great dinner! After leaving Sucia Island we will be on the lookout for Dahl Porpoise and dolphins ,and say goodbye to beautiful Mt. Baker for a while. We usually have some good wind for a great sail to Roche Harbor, which is our next destination. The quaint resort with its beautiful gardens, chapel, and the Hotel de Haro (where Teddy Roosevelt stayed) will charm you. Homemade donuts are a very special treat at the cafe. Enjoy one with your latte at the coffee stand. After enjoying Roche, we will motor through Mosquito Pass to Garrison Bay, where we will find British Camp, home of the Pig War and a great story to share. If oysters are a favorite, we can get fresh ones at Westcott Bay for a nice appetizer. After leaving Garrison Bay we will continue out through Mosquito Pass to look for the whales. 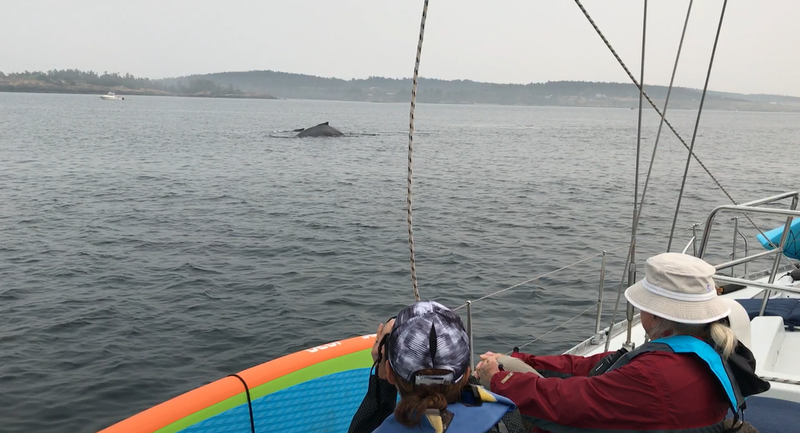 Many times we have found whales as we head north to beautiful Prevost Harbor on Stuart Island. It may be the photo opportunity you have been waiting for. There are great hikes on Stuart Island. The favorites are the hike to the one room schoolhouse, and to Turn Point Lighthouse. It is fun to explore the history of this wonderful island. If we're lucky, we may even spot a wild Mouflon! Friday Harbor and shopping! It's time to get off the boat for some great souvenir shopping, visit the whale museum, rent a bike or a moped or just watch the ferries come and go. This is your night to eat at one of the delicious restaurants in town while the crew takes a break and does some re-provisioning. Time to say goodbye to Friday Harbor and head to anchorage for our last night. Depending on the weather, we will either stay at Rosario, a beautiful resort with lots of fun history, or cross the straights to anchor in a cove for our last night. Time to disembark after a spectacular time enjoying the islands, meeting new friends, eating like royalty, and making great memories. Relax and enjoy your cruise back to the dock in Bellingham. It is hard to say goodbye, but perhaps we will meet up again next year. Viewing one, maybe two, resident Orca pods! Unrivaled Northwest Cuisine and service in an incredible setting for every meal. Paddle boarding, kayaking, and even swimming (for the bold!) the crystal clear waters of the Salish Sea, and some island lakes. Crabbing our secluded anchorages and awaiting the feast to come! Viewing the wild Mouflon of Spieden and Stewart Island. Some of the most memorable sunsets to be had anywhere...mountains, water, and plenty of wine! Spending time with a crew who is genuinely interested in making sure you have one of the best weeks of your life. Prices include all food (you are responsible for one meal "out on the town" in Friday Harbor), beverages, gear, and supplies. You will need to make travel arrangements to and from Bellingham, Washington (or give us a call and we'll help you out!). Prices do not include any of the following (if you choose to) : Alcohol, Fishing Licenses, or Crew Gratuities.